Thank you for the offering of £612 last weekend. 254 were at Mass - a new record. Meets on Tuesday evening at 7.00 pm. There will be a retiring collection after all Masses this weekend to meet the costs of flowers to decorate the churches this Easter. The festival choir meets this Sunday evening at St. Margaret Mary at 6.30 pm. Thanks to all who have come along to sing and play. As usual Our Lady and St. Joseph is arranging a coach to the Chrism Mass at Lancaster Cathedral on Maundy Thursday, 2 April. The coach will leave at 9.00 am and return in the afternoon. Cost - £12 to be paid on the day. If you’d like to go, please contact: 01228 521509. If a parishioner, who is a tax payer, would like to join the scheme, contact Paul on 511387 for CTK or Richard on 544737. Easter Sunday Masses are 9.00 am at Christ the King and 11.00 am at St. Margaret Mary. Please maintain an air of dignified silence as you enter the church for the celebration of the Triduum - particularly on Good Friday afternoon. This will take place on Holy Saturday morning at 12.00 noon. Thank you to all who assisted at the funeral of Fr. Michael Murray. Starts at Our Lady & St. Joseph’s Church at 5.30 pm and walks to the Wayside Cross at Wetheral on the A69. A reminder that Good Friday is a day of Fasting and Abstinence. The Good Friday collection is to support the Holy Places in the Holy Land and the Easter Sunday collection is to the clergy of the parish. SIR – Following the Extraordinary Synod of Bishops in Rome in October 2014, much confusion has arisen concerning Catholic moral teaching. In this situation we wish, as Catholic priests, to re-state our unwavering fidelity to the traditional doctrines regarding marriage and the true meaning of human sexuality, founded on the Word of God and taught by the Church’s Magisterium for two millennia. We commit ourselves anew to the task of presenting this teaching in all its fullness, while reaching out with the Lord’s compassion to those struggling to respond to the demands and challenges of the Gospel in an increasingly secular society. Furthermore, we affirm the importance of upholding the Church’s traditional discipline regarding the reception of the sacraments, and that doctrine and practice remain firmly and inseparably in harmony. Catechesis continues on Thursday evening at 5.15 pm. It is now too late for children to join the programme this year. Please keep the children and your families in your prayers. 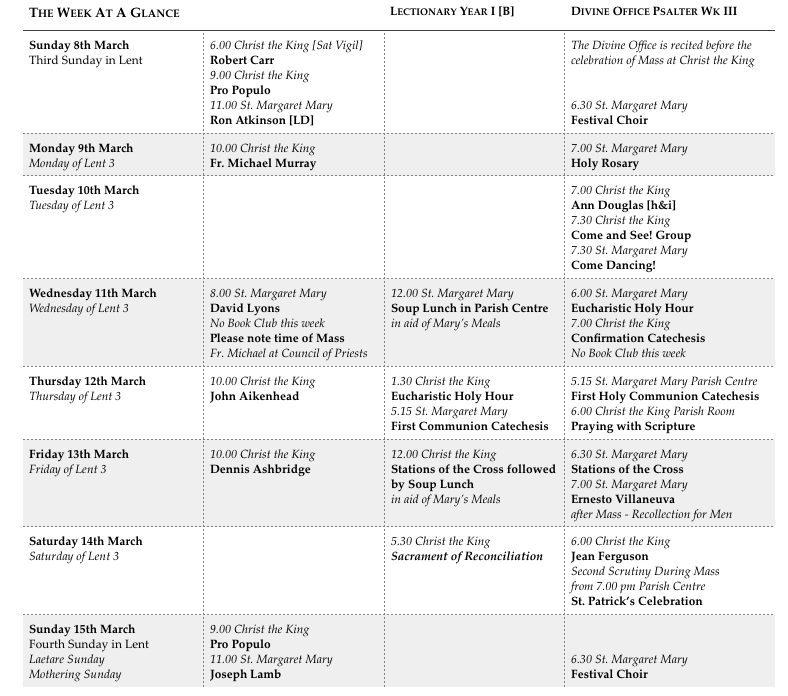 Please note the time of the catechesis this week. Bible Alive and Walk with Me are still available to purchase to help you in your Lenten journey. Please consider buying one. Thank you for the offering of £876.02 last weekend. 277 were at Mass - a new record. There is no Book Club this Wednesday due to the Funeral of Fr. Michael Murray. Meets on Tuesday evening after Mass. Monday to Wednesday 10.00 am - 2.00 pm and Sunday 12.00 noon - 3.00 pm. For more information contact the centre manager, Trevor Tiffin on 524295. Donations will be gratefully received for flowers for Easter for St. Margaret Mary Church. The Triduum will be held there. Any amount you can afford will be most welcome. Donations can be left [in an envelope marked ‘Easter Flowers’] in church or with Mrs Mary McGuiness. There will be a retiring collection next Sunday [Palm Sunday] to cover the cost of Easter Flowers at Christ the King. 22nd March and 29th March. All dates are Sundays beginning at 6.30 pm. The remainder of rehearsals will take place at St. Margaret Mary Church. Once again St. Margaret Mary SVP will be organising distribution of food parcels before Easter for those in need. We hope to deliver the parcels the week beginning Monday 23rd March. Please leave items in the box at the back of church, having checked the best before date. Thank you for your continued support. This will be held this Thursday, 26th March at 7.00 pm at Christ the King. Please come along and bring a friend. This beautiful form of prayer is an ideal opportunity to encounter Christ in prayer this Lent. 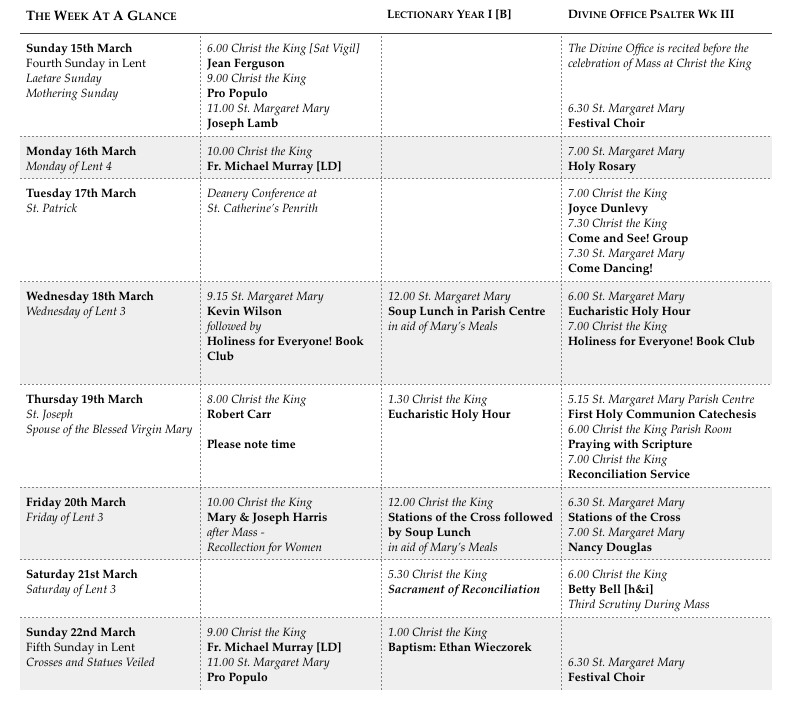 As usual Our Lady and St. Joseph is arranging a coach to the Chrism Mass at Lancaster Cathedral on Maundy Thursday, 2 April. The coach will leave at 9.00 am and return in the afternoon. Cost - £12 to be paid on the day. If you’d like to go, please call 521509. 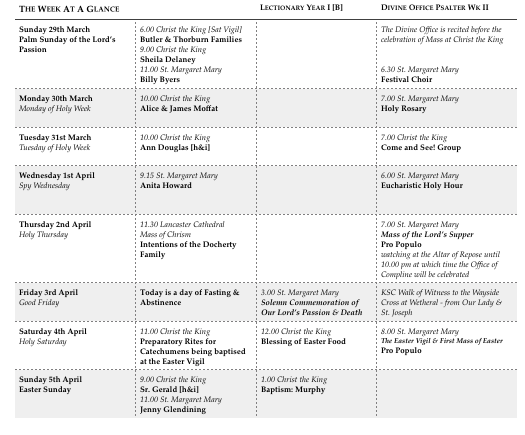 Could you please indicate your availability for the Sacred Triduum of Holy Thursday, Good Friday and Holy Saturday by adding your name to the forms found at the back of both churches. If a parishioner, who is a taxpayer, would like to join the scheme, please contact Paul on 511387 for CTK or Richard on 544737. Please consider giving via the Gift Aid scheme - it increases your donation without any additional cost to you. Your donation is treated in the strictest confidence. Monthly days of worship, prayer and praise. The next date is Saturday March 28th at St Edmund’s Church, Orton Rd, Carlisle. Our speaker will be John Lindsay. All welcome. Renewal days start at 11.00 am and finish around 4.00 pm. Please join us, even if you cannot stay for the full day. Tea and coffee provided but please bring a contribution to a shared lunch. For further information, please contact Janice Wrench on 01768 868489. Catechesis continues on Thursday evening at 5.15 pm. It is now too late for children to join the programme this year. In your charity, please pray for the repose of the soul of Fr. Michael Murray who died in the early hours of Wednesday morning. We extend our sympathy to his sister Ann and the wider family. May he rest in peace. Details of the funeral arrangements will be published shortly and the Requiem will hopefully be celebrated by the Rt. Rev. Terence Drainey, Bishop of Middlesborough, the diocese Fr. Michael served. Christ the King will host a reconciliation service [with individual confession] on Thursday 19th March at 7.00 pm. Please come along and use this opportunity to make a new start with Jesus. Thank you for the offering of £629.50 last weekend. 256 were at Mass. There is no Book Club this Wednesday - Fr. Michael is representing the deanery at the Council of Priests at Bishop’s House. Happy Mothers Day to all our mothers! On Wednesday and Friday - why not come along and support the work of Mary’s Meals. 15th March, 22nd March and 29th March. All dates are Sundays beginning at 6.30 p.m. The remainder of rehearsals will take place at St. Margaret Mary Church. Once again, St. Margaret Mary SVP will be organising distribution of food parcels before Easter for those in need. We hope to deliver the parcels the week beginning Monday 23rd March. Please leave items in the box at the back of church, having checked the best before date. Thank you for your continued support. 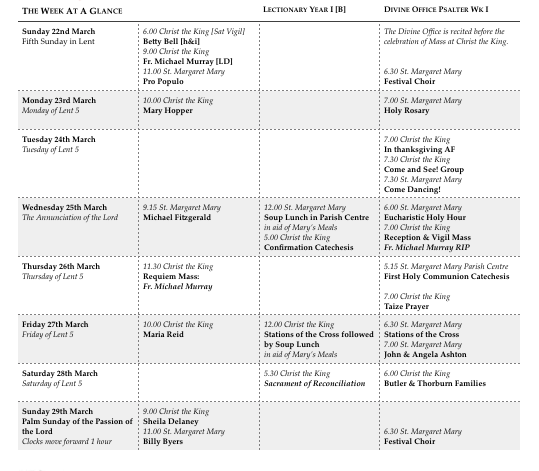 A weekend with the Cor et Lumen Christi community in Wigton between 20th and 22nd March. Donations to cover costs. For more information call 016973 45623. This will be held at Christ the King on Thursday 26th March - come along and bring a friend. This beautiful form of prayer is an ideal opportunity to encounter Christ in prayer this Lent. As usual, Our Lady and St. Joseph is arranging a coach to the Chrism Mass at Lancaster Cathedral on Maundy Thursday, 2 April. The coach will leave at 9.00 am and return in the afternoon. Cost - £12, to be paid on the day. If you’d like to go, please contact them on 521509. This Friday at Christ the King a morning recollection for women - a talk, a period of Eucharistic Adoration [with opportunity for confesssion] and Benediction of the Blessed Sacrament. All welcome. We welcome back to the parish Fr. Norman Johnston who will be celebrating the 9.00 am and 11.00 am Mass this weekend. Could parishioners at Christ the King please return their red Mission Boxes to the parish in order that they may be counted. Please consider giving via the Gift Aid scheme - it increases your donation without any additional cost to yourself. Your donation is treated in the strictest confidence. 14 Candidates have come forward to enlist on the course preparing them for First Holy Communion. Please pray for these children as they ready themselves to receive our Lord for the first time in the gift of the Eucharist. St. Patrick’s - a right song and dance! Tickets are available for the Parish celebration on Saturday 14th March. Entertainment and Pie and Pea Supper. Why not come along and join with other parishioners for what looks to be a great evening planned? Christ the King will host a reconciliation service [with individual confession] on Thursday 19th March at 7.00 pm. Please make a date in your diary. A number of different priests will be available. Thank you for the offering of £860.29 last weekend. 243 were at Mass. Monday to Wednesday 10.00 - 2.00 pm and Sunday 12.00-3.00 pm. For more information contact the centre manager, Trevor Tiffin on 524295. Donations will be gratefully received for flowers for Easter for St. Margaret Mary Church. The Triduum will be held there. Any amount you can afford will be most welcome. Donations can be left [in an envelope marked ‘Easter Flowers’ in church or with Mrs Mary McGuiness. 8th March, 15th March, 22nd March and 29th March. All dates are Sundays beginning at 6.30 pm. The remainder of rehearsals will take place at St. Margaret Mary Church. Parishioners are needed to volunteer for this important ministry in the Church - especially younger parishioners. To proclaim God’s Word during the celebration of the Mass enables God to speak to us and touch our lives. Please consider coming forward for this ministry. Anybody? Adult men and boys are needed to assist with the celebration of Holy Mass through the ministry of serving. Not only does this add dignity to the celebration of Holy Mass but enables greater participation of all who are present. We have a good and faithful team of servers at St. Margaret Mary but none at Christ the King. The Mass is never a ‘solo performance’ - help is needed in this area. Please consider coming forward - Mass can only really continue in churches where people are willing to be involved and actively so. Anybody? As usual Our Lady and St. Joseph is arranging a coach to the Chrism Mass at Lancaster Cathedral on Maundy Thursday, 2 April. The coach will leave at 9.00 am and will return in the afternoon. Cost, £12, to be paid on the day. If you’d like to go, please contact them on 521509. On 15th August this year the 60th Anniversary of the opening for worship of Christ the King church will take place. The anniversary will fall on a Saturday. If you have any suggestions on how to mark this occasion, please have a word with Fr. Michael. This Friday at St. Margaret Mary an evening recollection for men - a talk, a period of Eucharistic Adoration [with opportunity for confession], Benediction of the Blessed Sacrament followed by a social in the parish centre. All welcome.